the same reamer and at the same time if survey lines have been established, pallet staging has been accomplished, and sufficient personnel are available. A typical keylock section is laid every 100 feet, starting with the 100-foot mark on either side of the starter keylock. The general sequence of laying mating for the runway with the guide rail installed is to start at one end (at the approach apron) and work toward the opposite end. The guide rail divides the runway into two sections, 18 feet and 78 feet (or 18 feet and 30 feet for a 48-foot runway). Individual mats are laid in a brickwork type of pattern from the guide rail to the outer edge in each section when facing the working area. The starter keylock is not used when laying a runway with a guide rail. 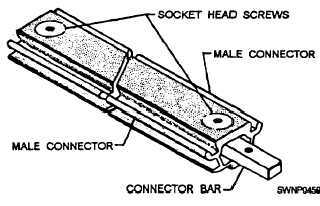 Instead, typical keylocks are laid at 100-foot intends on the runway, and other sections of the SATS field are laid as explained in the previous paragraph. Be sure to inspect visually upturned sides and end connectors of AM-2 matting for foreign matter before placing them in position. The presence of dirt, chips, stones, and so on, can prevent proper interlocking of the mats. Brooms or brushes can be used to clean foreign matter from the connectors. The sequence for installing AM-2 mats and related components where a guide rail is not required is shown in figure 11-6. The sequence can be modified, so work proceeds on only one row of mats at any given time; however, SPEED OF INSTALLATION IS IMPORTANT. The sequence, as shown in figure 11-6, allows the use of at least two crews with six 2-man teams on each crew carrying and placing mats and keylocks. When placing AM-2 mats, you should have three types of keylocks: starter, typical, and female. You should use a step-by-step procedure to place the AM-2 mats. Figure 11-7. - Starter keylock. are furnished in 3-foot, 9-foot, and 12-foot lengths to allow for the staggering of joints in matting patterns. The starter keylock is coated with a nonskid material. It is not used in installations having a guide rail. TYPICAL KEYLOCK. - A typical keylock (fig. 11-8) is inserted every 100 feet in the pattern to permit the easy removal of sections of the matting for a multiple-mat replacement. For this reason, only a maximum of 50 feet of any one section needs to be removed to replace mats that could not economically be replaced as individual units by replacement mats. Typical keylocks are furnished in 3-foot, 9-foot, and 12-foot lengths to allow the staggering of joints of matting patterns. The typical keylock is coated with a nonskid material. FEMALE KEYLOCK. 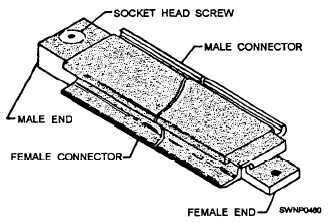 - A female keylock (fig. 11-9) is used to join two adjacent male mats. The female keylock is coated with a nonskid material. Figure 11-8. - Typica1 keylock.